1. Slice your pear in half, lengthwise and place this half, skin side up on a plate. 2. Next, use your knife and cut your rainbow of fruit into small, bite-size pieces. You don’t need to cut the orange segments or blueberries because they’re pretty bite-sized to begin with. 3. 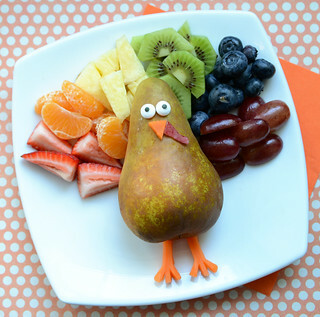 Place your colourful fruit around the turkey for feathers in a rainbow colour scheme. 4. Using your knife, slice your baby carrot into 1 small triangle for the nose and 2 legs with feet. Place these on your turkey. 5. Carve your small piece of apple skin into the turkey’s gobble-thingy and place this on the turkey. 6. Finally, grab your icing eyes and place them on the turkey. This little turkey is so bright and colourful, it’s sure to bring a smile to your kids faces. Enjoy!